1. Trim any woody bases from the sprouts then shred very finely (use the shredding attachment on a food processor if you like). Set a large frying pan or saucepan over a medium-high heat. Add the butter, allow it to warm, then add the shallot and a pinch of salt. Soften for 5 minutes without colouring, then add 2 crushed garlic cloves and ¹⁄ ³ of the anchovy fillets with 1 tbsp of the anchovy oil. Cook for 90 seconds, stirring, until the anchovies begin to melt. Tip the sprouts into the pan and cook for 2 minutes, stirring occasionally, so that they’re bright and glossy. 2. Add the cream, parmesan and 100ml water; allow to bubble up and warm through for 1 minute. Take the pan off the heat and add the lemon zest, nutmeg and lots of black pepper. Decant into a low-sided, ovenproof sauté pan or casserole dish. Preheat the grill to high. 3. Wipe out the frying pan then add the remaining chopped anchovies, the remaining anchovy oil from the jar and the extra virgin olive oil. Cook over a low heat until the anchovies begin to melt. Add the remaining crushed garlic clove and remove the pan from the heat, leaving the garlic to soften and flavour the oil for 5 minutes, without burning. 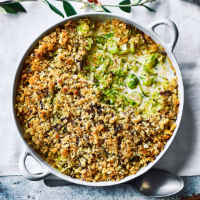 Stir in the breadcrumbs and herbs, if using, until golden, then distribute evenly over the top of the sprouts. To finish, put the dish under the grill for a few minutes until crisp, golden and heated through.